You can’t, and nor can I. So the raid must have been authorized by another, or others. This means that the significance of what took place recently in our wonderful town of Foolsville, the fictitious town so memorably described by Mikhail Saltykov-Shchedrin in his novel History of a Town (1870), was a great deal more than just another banal corruption scandal in the defence ministry. It was the ritual and overt debunking of the Kremlin flock’s alpha male, who turned out to be not quite so alpha, simply a not very efficient manager with little control over his surroundings. He’s not yet attained the status of Lenin in Gorki i.e. he’s not being pushed around in a wheelchair by loyal lady Duma deputies, but this unpleasant little story has played out against the backdrop of growing doubts being expressed by the ‘golden thousand,’ the Russian billionaires and multi-millionaires. Can they still count on him to guarantee the preservation of their assets, their ability to pass them on to the next generation, and to oversee their legitimization in the West? We understand from well-informed sources that people inside the circle are increasingly beginning to muse over the possibility of finding ‘someone else’ to occupy the key position of president and protector. Especially after the beginning of September when our hapless alpha-crane was incautious enough to let slip a comment on the desirability of assets belonging to the elite being brought back to where they historically belong and, thus, under his autocratic wing. Can the golden thousand still count on Putin to guarantee the preservation of their assets, and to oversee their legitimization in the West? As Roman Abramovich (British) and Gennadii Timchenko (Swiss-Finnish) are the guardians of the billions he has in his personal get-out-of-gaol fund, this was hardly the action of a mate. It was September that saw the beginning of his image problems. From the very first minutes of the Serdyukov nuclear crisis it was abundantly clear whose the side the masters of TV were on. Viewers were staggered to see on their screens the mountain of valuables belonging to femme fatale Yevgeniya Vasilyeva, and to hear Serdyukov being described as Field Marshal Taburetkin [Rn taburet – stool], a nickname referring to his past as a furniture salesman, but hitherto unthinkable on state TV. To get back to the 'someone else'… As the words of the hymn have it, 'thou shalt know him when he comes.' It seems to me that the elite has already recognised him. 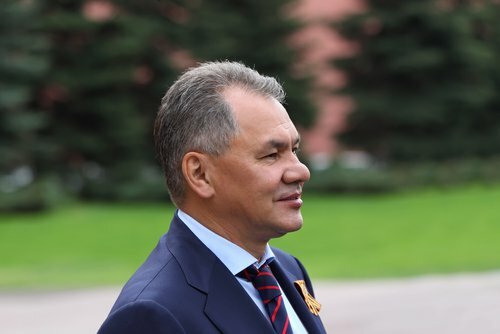 If one looks at newly-appointed Defence Minister Sergei Shoigu through the eyes of an ordinary Russian billionaire, how can one not see a potential 'someone else'? Someone who would be capable of ensuring that the kleptocratic feast keeps going, which the exhausted galley slave, mired in his friends' financial scandals, clearly cannot do. Shoigu, and no one else, is that 'someone else' so desperately needed today by Russia's golden thousand. Shoigu has more than 20 years irreproachable service, working alongside old family friends. As Minister for Emergency Situations he was tested in extremely difficult situations involving floods, earthquakes, coups and acts of terrorism. He is an army general and at home among the siloviki. He has a mansion in Rublyovka and his wife is an exceptionally talented businesswoman. All just as it should be. Miraculously there is not a single blot on his snow-white escutcheon and, most importantly, Russian TV screens regularly show him engaged in saving people, extinguishing fires and reconstruction – NOT in Courchevel or Nice, but in our own Back of Beyond or Nowhere in Particular. He's the only person in the elite who could be promoted relatively honestly, without any horrendous lies, to the people at a snap presidential election, if that proved necessary. He, and no one else, is that 'someone else' so desperately needed today by Russia's golden thousand. And, moreover, he's so good at the emergency part he's now playing that even Putin might well regard him as his very own 'someone else'. Putin realised that he was in a tight fix and absolutely must not appoint any of the three burks from among his own cronies who had their eye on Serdyukov's job. He would have to return to the pinnacle of power a man he himself had sidelined, the loyal Shoigu. Putin has been so badly conned by his cronies that, in the light of his new, post-Serdyukov, existential experience, he could hardly have failed to wonder whether he would be able to manage the super long-distance run he had set himself for life without breaking his neck. The slave lost his nerve and started thinking about doing a runner. Perhaps the brilliant political technology [spin doctor manipulation] combination of 1999 could once more be applied to our elite? Then the Yeltsin clan put in power a Yeltsin protégé, who was completely dependent on him, selling him to the people as anti-Yeltsin. So why couldn't the very same Yeltsin-Putin clan put their man in power, selling him once more to those same people as anti-Putin? — a legal ban for all time on the question of extradition. So why aren’t you saying anything? You should be shouting: Long Live Tsar Sergei Kuzhugetovich Shoigu!